According to Pastor Godswill, “Immediately, he told us to get all the journalists on our pay roll and instructed the visitor's coordinating zone to fix cameras everywhere even outside the gate so that if Oyakhilome gets only as far as the gate the visit would be captured. That was what we did. It was deliberate; that automatically put Oyahkhilome in the ranks of the junior prophets while he (Joshua) stood by as the leader and supervisor. 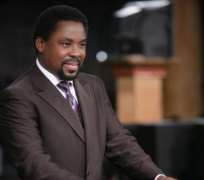 Immediately after Oyahkhilome's visit Pentecostal Pastors began to come to the Synagogue”. We used those hand and leg movements with deep penetrating gaze to control the human body. Sometimes when a person was falling and we observed he could injure himself, we could move the person either from falling away from any dangerous object with our mind. It's pure hypnotism”. “ I can say that I was personally initiated but I cannot speak for others because, I cannot say since I was not there. But the much that I was privy to, I have divulged”, adding, “was initiated in that shrine. We call it mountain. Every one of the junior prophets has a personal hut in that shrine. We don't call it shrine; we call it mountains, just like every other church consecrates a particular place as their prayer mountain”.